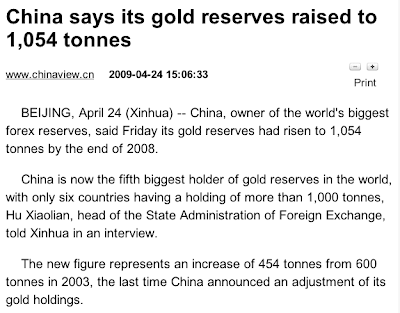 China has just revealed that it holds a thousand tons of gold - the 5th biggest hoarder in the world. China is diversifying their reserve assets away from the inherently shaky US dollar and into other currencies... and gold. This is on order to prepare for the day - not too far distant now - when they de-couple from the fixed 6.8 Yuan to the USD exchange rate - on Chinese terms and at China's timing. Their establishment of a Yuan settlement system for overseas trade in some of their Southern cities is the start of creating a Yuan zone in the same way the Americans have done in their sphere of influence. Tellingly the Brazilians and the Argentines have this month moved to settle in their own trade in their currencies rather than in USD - two days later it was announced the Argentines had signed up for a Yuan facility. These are all related moves. It has been very clear since the Chinese authorities released their plans in the Christmas holiday (so that it wouldn't upset the apple cart) that they intent to have their money as a reserve currency. They tried to edge it in at the IMF last month under the guise of a new multi-currency based settlement unit, but the Americans rebuffed them. The pressure is now on - since they met that initial resistance - to go about it in other ways. The Economist has some positive news about the capacity of the Chinese economy and says their form of state ownership or control of capital and business may have advantages over the West's model as far as getting value for stimulus spending is concerned. China’s economy is less dependent on exports than popularly believed. Exports account for nearly 40% of GDP but they use a lot of imported components, and only make up about 18% of domestic value-added. Fewer than 10% of jobs are in the export sector. If a collapse in domestic demand led China’s economy down, it can also help lead it up again. Not only is China’s fiscal stimulus one of the biggest in the world this year, but the government’s ability to “ask” state-owned firms to spend and state banks to lend means that the government’s measures are being implemented more rapidly than elsewhere. To take one example, railway investment has tripled over the past year. Only about 30% of the government’s 4 trillion yuan ($585 billion) infrastructure package is being funded by the government. Most of the rest will be financed by bank lending, which had already soared by 30% in the 12 months to March, twice its pace last summer. The Qingdao review did include an interesting addition to China’s fleet, a Yuzhao-class amphibious-assault ship, which could be used to dispatch troops and helicopters over long distances. One Western diplomat says he sees its deployment as potentially useful for settling scores in the South China Sea. The contrast between the display of such weaponry and China’s rhetoric about harmony he calls “a bit of schizophrenia”. China’s self-image as a responsible great power was also on show, however, with a large new hospital ship, useful for humanitarian missions. Three vessels have just completed an anti-piracy tour in the Gulf of Aden. This continuing mission is China’s first active naval deployment beyond the Pacific. Chinese leaders chose not to spoil the jolly mood in Qingdao by talking about aircraft carriers. But officials have dropped several recent hints that China is close to announcing it will acquire its first one. go china! the new empire! "China is diversifying their reserve assets away from the inherently shaky US dollar and into other currencies... and gold"